I inherited my first slide rule from my Dad who had used his in college. That slide rule has 32 or 33 scales on it, each a different mathematical computation, and was made of bamboo, a fact my Dad pointed out that during the winter the guys with the aluminum slide rules had a harder time as the cold would cause them to get stuck. I used a slide rule in my 10th grade chemistry class, and by the 12th grade everybody had “four banger” calculators. You couldn’t open a newspaper without seeing advertisement for the calculators as they quickly dropped from $100-$400 down to $29. 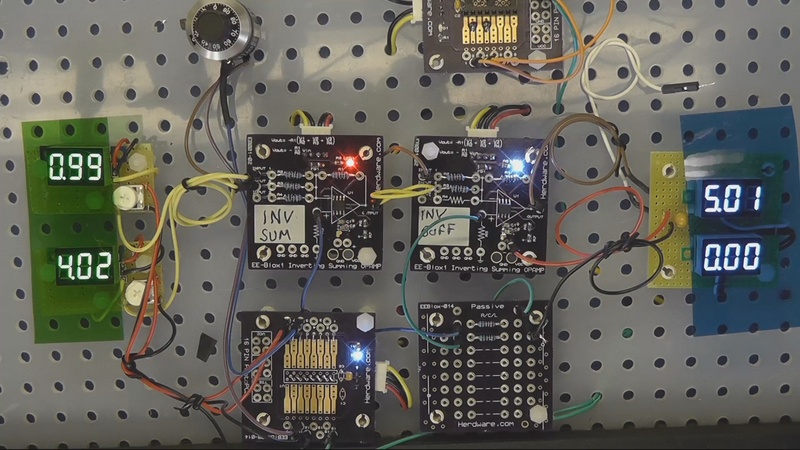 Jump forward to today as I sit in front of a breadboard with a couple of analog Op Amp modules and a couple of little voltmeters. 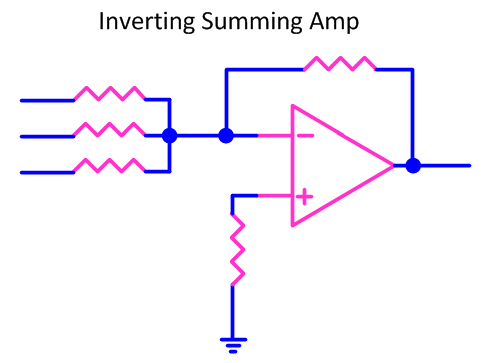 There are three basic styles of DC amplification with Op Amps; inverting, non-inverting and differencing depending on which inputs you inject the signal. In the case of differencing, the signal is injected into both inputs. It’s easy to see then how to add two voltages together, I go so far as to print the formulas on my own PCB’s to help me remember but the determining factor is there will be a voltage divider formed by the resistors that is connected to one or more inputs. Simply put, a circuit that feeds a proportion of the signal back into the inverting input will have a gain set by that proportion. Quickly becoming bored with addition and subtraction we move up to multiplication. 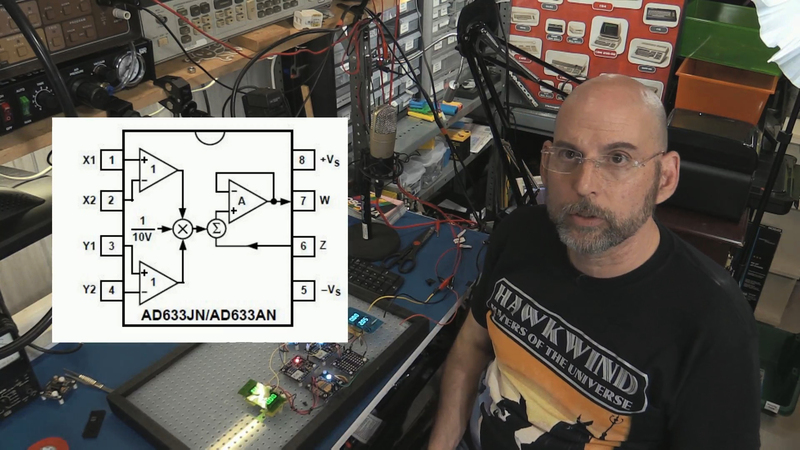 Using a venerable Analog Devices AD633 four quadrant multiplier, it’s easy to show multiplication in action and wiring the same voltage to both inputs results in square/square root. What makes the AD633 so usable is it has been engineered to be somewhat precise about utilizing the internal logarithmic behavior and then includes gain so that the small usable area of the curve becomes a bigger usable area… big enough to see on my little three digit voltage displays. And finally we take multiplication back to AC where the fun is; injecting a tone in one terminal and a control voltage in the other we recreate a Voltage Controlled Gain block like might be found in an analog synthesizer or as part of an Automatic Gain Control (AGC) system. This is the heart of Amplitude Modulation as used in radios and complex audio synthesis such as ring modulators in 1970’s synthesizers. 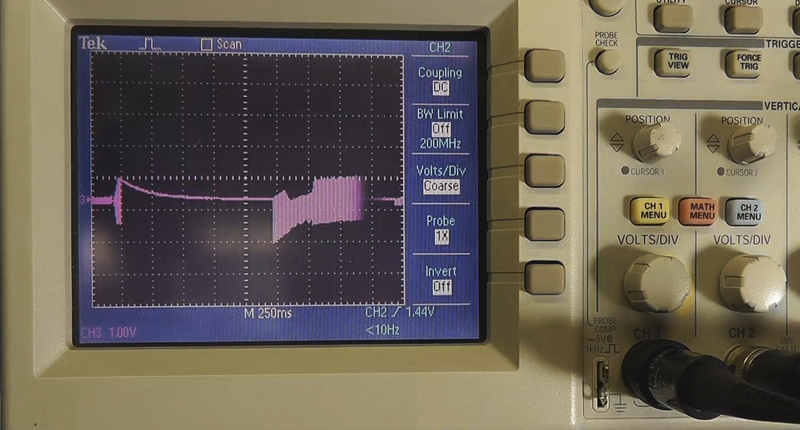 Waveform of a control signal multiplied times an audio signal. The AD633 does a good job of multiplying both DC and AC signals. Basically it uses the inherent logarithmic characteristics of diode/transistors junctions but is also surrounded by carefully trimmed parts (laser trimmed resistors) and built in amplification to make the most use of the desired log responses. depends on the experiences of your grandparents as well. very few of my parents and grandparents generations attended college, and many of them didn’t attend high school. I have two slide rules and I’m 19. One small for technicians and the other one 12 inches long with the scale split in half for extra precision. However I don’t use them much since I’ve memorized logarithmic tables. If you have an analogue multiplier circuit you can draw Lorenz’s attractor on your oscilloscope. Although I don’t use it anymore, my slipstick still holds a place of honor somewhere in a desk drawer. Yup I multiply with the AD633 for both DC and Audio near the end of the video.. By hooking both inputs together it also does squares and also can be used as an AM modulator/Voltage Controlled Amplifier. if you want real neat tricks, here is one that use only opamps and resistors to make a multiplier. Warning: It is a technical paper, so there is a lot of math and analog background required to understand. Right and the number of adjustments to center the range in the usable logarithmic response is very visible and a fairly accurate representation of how many things you would have to tweak just to get close. Also temperature skews right away.. By using the AD 633 in this case (the part is older than my son) you get the benefit of laser trimmed resistors and basically a balanced circuit to start with. The amps to bring the log range out to where I can demonstrate voltages between 1-9 is just an added plus. I have also seen using the filament of a bulb or photo receptor to get the log function also. Yes, this stuff is old. I found that because of the limiting technology back then, that there are more ingenious solutions. These days youngsters just throw resources at things and lacks the elegance of simplistic designs. More MIPS … more MIPS. Analog isn’t dead lol. A digital solution can only have the correct result so many million times a second and some times that isn’t good enough. You need analog that always has the correct result. DSP can only go so far, after that you need analog. For many the stumbling blocks in analog are op-amps, phase locked loops and carrierless modulation. We are at a point (in last few years) when a power supply using digital control feedback loops beats analog in performance. When I say digital, I mean high MIPS application specific DSP stuff not the crappy Arduino/PIC feedback loops (which I can easily beat as in PWM frequency & BW with analog chips from 1980’s.) Stuff you can tune their performance, trade off and do stuff that is hard in analog. These days we also have DPLL, NCO and SDR. Fun things and good times for people that know how to do it either way. The rest just like their blinking LED. Great article/video! More like this!!!! That’s one of the reasons why sometimes we use dB (20*log10(output/input)) for things e.g. amplifier gains, insertion losses etc. even now that we have computers. So at the syslem level, you can just add them together to get the overall gain… effectively multiply them. I was the end f the slipstick era… went through college with both a sliderule and an HP calculator. Used the sliderule more (circular 14″ equivalent) Have a 4 foot Pickett classroom rule hanging on the wall next to me right now… grabbed it out of the dumpster at work. As for logs, I tell my students that all logs are the same, as are all exponentials. The only difference due to the base is scale in one dimension, just like all sine/cosine or quadratic are the same except for scale and shift. This is in contrast to higher degree polynomials and composited functions, which are distinct under linear transforms. As a side note: my favorite multipliers are still the transconductance amp (fastish one or two quadrant) and the LED/CdS (slow two quadrant) pair. This is just what i keep visiting Hackaday for. Thank you for the history and electronics lesson! That’s not even fun, slideruler or not. You don’t use a shovel when building a house but machines? Do you want them to use that on the ISS today? Probably not. Or use a horse and carriage instead of a car? Some things better left alone and forgotten. Who cares how anything works? Let’s just all go watch Jersey Shore. The tools you use today the progeny of the tools you declare to be forgotten. I can tell how many houses you’ve built reading your comment. What if you were to try and make an ALU out of analog components? Couldn’t it be faster? Like doing operations in less time and some operations in constant time vs linear time? It would probably have settling times longer than the digital versions because it has to be read out somehow and ADC is not exactly simple. The main advantage would be if you don’t need very much precision. Maybe if you kept the total capacitance low, and the resistance as well, currents would be able to flow and settle easily and quickly. But then power consumption would be way up. Hm, maybe there’s a swings:roundabouts formula for this somewhere. Well we are talking performance here and if we only need so much accuracy? Why hasn’t been employed more often? I know there are ADCs that can easily do 4 GSPS. I can think of graphic applications where an approximate number would just be fine. I must be a dinosaur. Nobody mentioned high school slide rule competitions. Which competitions specifically, as there was the see who can multiply fastest and then there was see who could beat the cr@p out of each other better…the sliderule basically being a condoned weapon you were allowed to carry. I was also pretty wicked with a violin bow…. Hah! I guess I’d forgotten about dueling with sliderules. I don’t have any experience with violin bows, so I’ll bow to your expertise there.